Oroklini or Voroklini Village as the Cypriots like to correctly pronounce was a quite a revelation to me, when we first went there I was almost disappointed as it seemed to be just concrete boxes, you know what I mean, villas, apartments and shops in that distinctive Cyprus square style, without much imagination which can be found all over the island. ...There is more to this village than meets the eye and it is only 20 minutes from Larnaca Airport and 15 minutes from Larnaca Town. You are also very close to the mixed village of Pyla. There is charm by the bucket load if you have time to visit late on in the afternoon or the early evening. 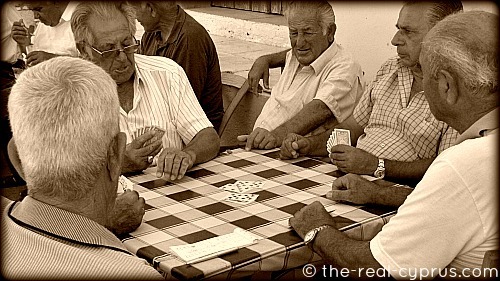 You may be blessed with a group of local men, outside the local cyprus coffee shop who are playing a few hands of their card game Billoti before they head home to their wives and families. And if you are really lucky they might invite you to join in... Mike was offered a hand if he wanted to play!. 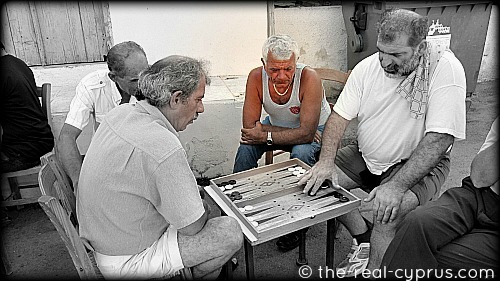 Alternatively, if cards are not your thing, you might like a more competive game of Tavli or backgammon. Tavli is the Cypriot name for it.. This game became even more exciting and louder than the cards...! Loud voices, arms swinging, slapping of thighs, anyone would think it was an argument, but it wasn't, just some good friends enjoying each others company for a couple of hours. 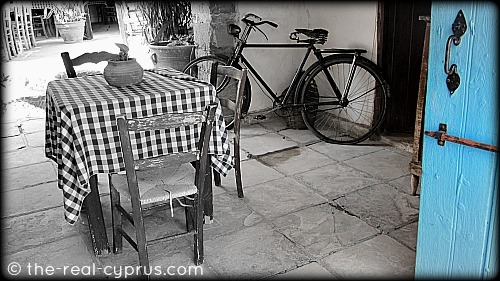 If you are looking for refreshment you can head for the Voreas Taverna, you cannot miss the classic Cyprus blue painted shutters and doors, and the quintessential checked tablecloths on the dining tables. This is definately a taste of the real Cyprus both literally and figuratively. 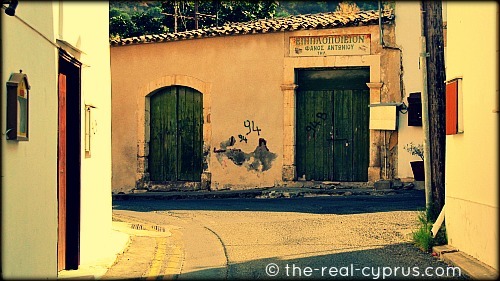 A bit on the expensive side, I thought, but if you are looking for photo opportunities and a chance to sit and eat authentic Cyprus food in a beautiful courtyard setting then this is a place to visit later on in the day. Very popular with local people and visitors, so they must be doing something right. Have your swim at the beaches off the Dhekelia road and then head for the village, only a very short distance from the main road. 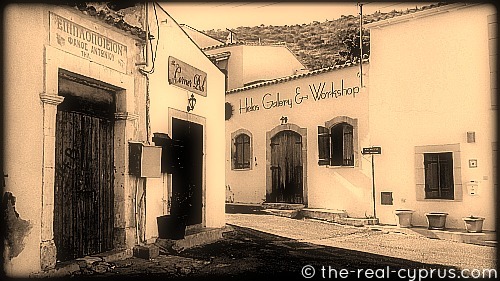 There are a 2 or 3 other places just to have a drink in the village, in the summer, chances are everywhere will be closed for siesta in the afternoon after lunch until about 4 or 5 pm, so keep an eye on the time if you are going to be gasping for a beer. Are You Searching For A Renovation Project? 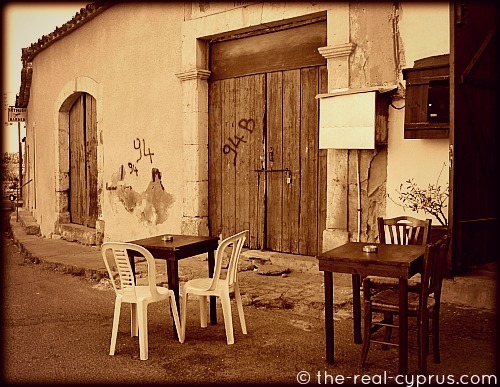 Oroklini Larnaca, is one of the few villages I have seen in this area that is quite lively and has a lot of houses for renovation. 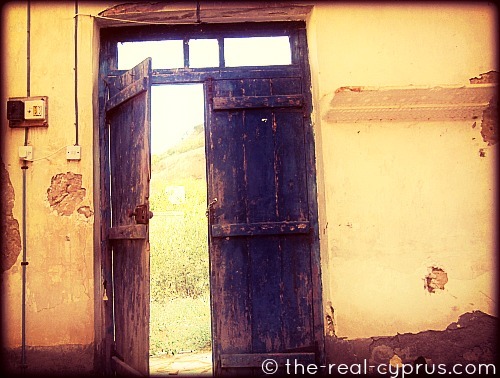 Usually in popular villages many of the old houses for sale in Cyprus are snapped up and renovated by foreigners but I was suprised to see so many waiting for the hand of someone with some heart and imagination, not to mention fairly deep pockets. If a Cyprus renovation is your thing, you just might find what you are looking for, and not too far from the sea, either if you don't mind slinging your cool box into the back of the car. 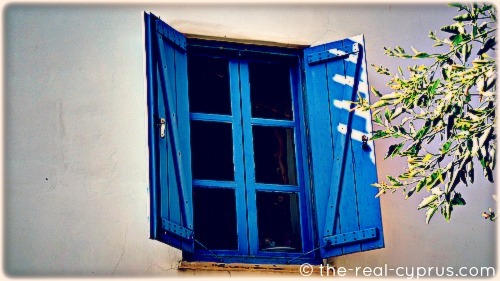 Looking For Self Catering In Oroklini? Voroklini Larnaca is a very popular area, because of the relative proximity of the Yannathes beach, a blue flag standard beach with great bathing and facilities available. If you look in the right hand column you will see a list of the most popular companies who advertise self catering accommodation in this area. You will find every available villa or apartment on these sites, so happy hunting. I hope you enjoy your visit to Oroklini Larnaca.